Peterson Select casings are weight sorted at the factory. All casings in a 50-count box are guaranteed to be within one grain of each other. They are also sorted by overall length and guaranteed to be consistent to within .001 inch. All Peterson Cartridge casings come in one of our plastic ammo boxes.The 10.36x77 (.408) cases for CheyTac® chambered guns is manufactured on Peterson Cartridge’s new, state-of-the-art case line which uses cutting-edge technology to produce some of the most precise and consistent casings on the market. Peterson Cartridge Co is committed to producing Match-Grade Brass that enables our customers to get more reloads per casing than industry average. This box of cases will incur a $2.00 shipping surcharge per box due to its size and weight. 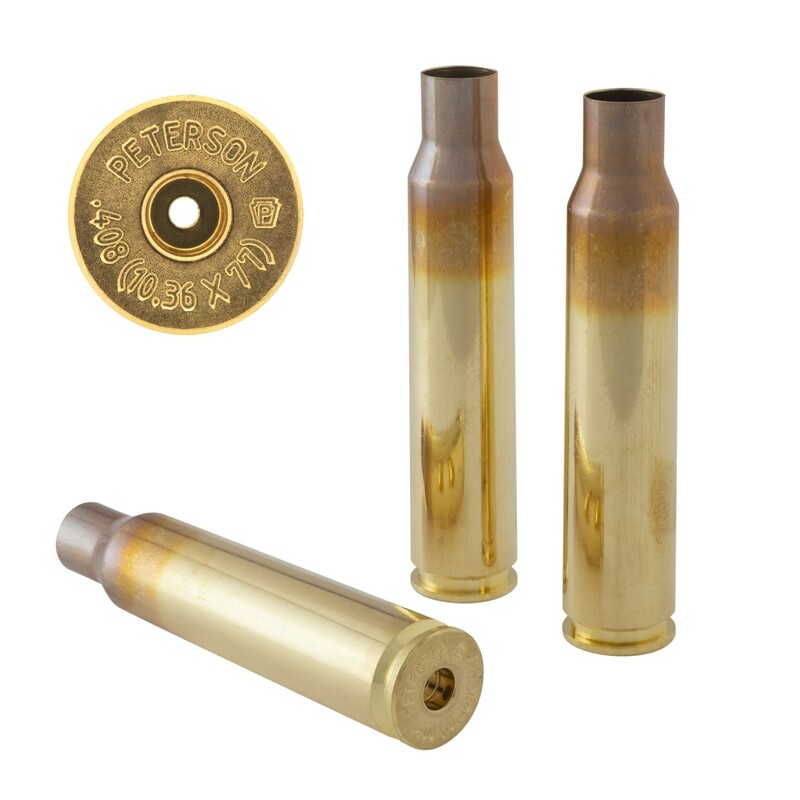 Unlike most of its competitors, Peterson Cartridge has devoted its entire facility, machinery, and laboratory to producing only brass rifle casings. Specialization is the driving principle behind Peterson Cartridge only producing one component of a multi-component finished product. In our mind, if you want precision projectiles, purchase them from a company that specializes in projectiles. If you want consistent propellant and primers, purchase them from a company that specializes in propellant and primers. And if you want extremely precise and consistent brass rifle casings, purchase them from us, Peterson Cartridge. Peterson Cartridge is dedicated to producing the best casings for long-distance shooters.